Photo by: Photos/video of Romeo by Thiago Garcia, Arturo Muñoz and Matias Careaga. We're all aware of the Romeo and Juliet storyline. What you may not have been expecting was the storyline to involve frogs. It's pretty ribbit-ing. 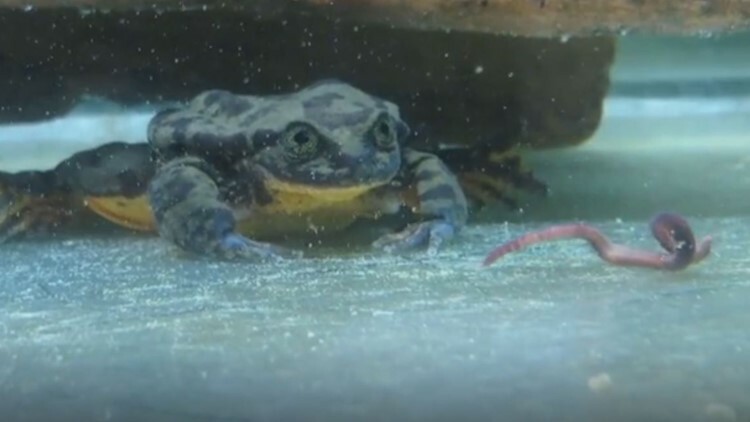 "Romeo" the Sehuencas water frog is said to be the "loneliest frog in the world" after biologists collected him 10 years ago, according to dailymail.com. His species was thought to be in danger of extinction by experts, so conservationists made him a match.com account. The profile playfully includes, "I'm literally the last of my species. I know - intense stuff. But that's why I'm on here," concluding with "no pressure ;)" in parenthesis. His dating profile says he is a "simple guy" who isn't picky and tends to keep to himself, "binge-watching the waters." Scientists now say they have found a potential love interest which, of course, they have named "Juliet," according to CNN. Zoologist Teresa Camacho led the frog search through the forest. After a long, tedious search during which they found another male of his species, scientists almost gave up. But then they found the jewel - a potential Juliet. In this case, researchers are hoping opposites attract, considering Juliet's extroverted and energetic persona. After researchers are sure she's free of any dangerous fungus, she is set to meet what will hopefully be her match, or Romeo. In this case, let's hope Juliet doesn't fake her death to get out of the date.